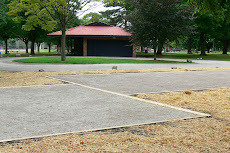 Pétanque Ann Arbor: Annual Tournament - Sunday, August 28th at 1:00 p.m. Annual Tournament - Sunday, August 28th at 1:00 p.m.
Great weather (well, perhaps a bit warm and humid) with no rain and great food. The triplet panache of 3 games of 24 players was well run by Jane and Jeanne. A Little Snooze on the Job ?